Wed, Jan 23, 2019, 09:56 am SL Time, ColomboPage News Desk, Sri Lanka. Jan 23, Colombo: Sri Lanka's promising young start-up ecosystem is set to accelerate into a new phase of growth with the upcoming grand opening of Hatch Colombo - the island's largest co-working office space, business incubator and accelerator designed for start-ups. Setting a tone for radical creativity and innovation, the grand opening will be organized along the theme of Celebrating Entrepreneurship commencing with a curated series of sessions around the start up ecosystem, its founders, investors and opportunities for aspiring entrepreneurs as well as students. The event will feature thought leadership from international success stories such as Facebook and Indiegogo. Notably, in addition to partnering the launch, Facebook has also entered into further discussions with Hatch with a view to exploring opportunities for further collaborations - particularly those with the capacity to further strengthen Sri Lanka's burgeoning start-up ecosystem. The sessions will kick off on 24 January 2019 with a high-powered CXO forum featuring an introduction from Hatch Co-Founder, Jeevan Gnanam and a special address from beloved former Sri Lanka Cricketer, Kumar Sangakkara. Day 1 of the Hatch Grand Opening will then conclude with a panel discussion, moderated by Hatch Co-Founder Nathan Sivagananthan, featuring Expolanka Holdings PLC Founder and CEO, Hanif Yusoof, ODEL PLC Founder and Embark Founding CEO, Otara Gunewardene, Spa Ceylon Co-Founder/Director, Shalin Balasuriya and Indiegogo CEO and Co-Founder, Slava Rubin. Over the next two days, Hatch Colombo open up sessions to the public, bringing together some of the brightest minds and most promising talent in Sri Lanka, commencing from 9:00 am on 25 January 2019 with a half-day session on the country's Start Up Ecosystem. Those interested in attending may register online on hatchworks.eventbrite.com to reserve a seat. The first half will feature participation from local luminaries like Sachindra Samararatne of ICTA, Prajeeth Balasubramaniam of LAN and BOV Capital, Heminda Jayaweera of Venture Frontiers and Mora Ventures together with Chandula Abeywickrema of LIIN, Aloka Gunasekera of Startup X Foundry, Chalinda Abeykoon of Crowd Island, Saman Maldeni of EDB, Anushka Wijesinghe of Global Innovation Council/Global Economic Forum, Sarit Fernando of Hemas Slingshot and Wishanth Wijesinghe of JKX who will address the topic 'Who's doing what for startups'. Attendees at Day 2 of the Hatch Grand Opening may also sit in on presentations from D.L. & F. De Saram on legal fundamentals of start-ups and measures to protect intellectual property and related assets, followed by a keynote address from Facebook, India & South Asia's Head of Strategic Product Partnerships, Satyajeet Singh. The Hatch X Facebook session will be followed by the 'She Means Business' panel discussion moderated by Sachindra Samararatne of ICTA with ZMessenger CEO, Jayomi Lokuliyana, RytTrak Solutions Co-Founder Nisha Tillas, and Facebook's Satyajeet Singh participating as panelists before concluding with a Facebook Developer Community Meetup featuring Dr. Ruwan Weerasinghe from University of Colombo School of Computing on NLP. The final day of the grand opening will be dedicated towards sessions on the future of entrepreneurship and will kick off with a panel discussion featuring 'The Crazy Ones': Kapruka Founder and CEO, Dulith Herath, Harpo's Cafes and Restaurants Founder and CEO, Harpo Gooneratne and Gamer.lk Founder, CEO, Raveen Wijayatilake, Good Market Co-Founder, Amanda Kiessel, and moderated by up-and-coming local science fiction author, researcher and programmer, Yudhanjaya Wijeratne. Parallel to the panel discussion, the event will also feature special events organized solely for the island's youngest aspiring techies as part of the 'Kids Can Code' event being hosted by Hatch in partnership with SLASSCOM that will provide children with a basic understanding of coding and how it can be implemented in practical situations. The second session for the day will focus on Smart Risk, featuring Ustocktrade CEO, Tony Weerasinghe and Poker Champion and Founder of The Movement, Anuruddha Meddegoda. The second half of sessions on the final day of the Hatch Grand Opening will lead participants through a Sinhala panel discussion with Khalid Oshman on his inspiring story of overcoming a variety of stereotypes in order to succeed, together with Bihan Mahadewa, one of Sri Lanka's youngest coders with an ambitious plan to start a Coding University. The final two sessions will be closed door events the first of which will focus on Investment in Emerging Markets, in a panel discussion moderated by CIMB Bank PLC CEO, Anarkali Moonesinghe and featuring Patamar Capital Managing Partner, Beau Seil, together with Asia Securities Holdings Pvt Ltd. Executive Chairman, Dumith Fernando, Ironwood Capital Partners Managing Partner, Hiran Embuldeniya and BOV Capital & Digital Managing General Partner, Prajeeth Balasubramaniam. The Hatch Grand Opening will conclude with a closed door Fireside Chat on the Future of Entrepreneurship moderated by Nathan Sivagananathan and featuring Indiegogo CEO and co-founder, Slava Rubin. 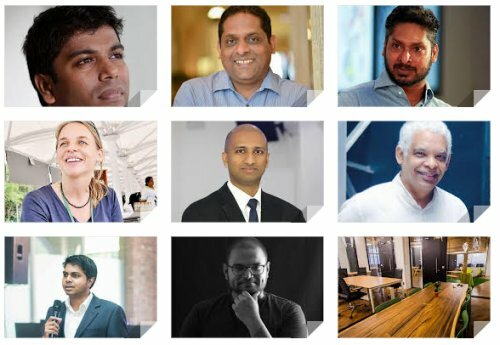 Situated in the bustling commercial heart of Colombo at 14 Sir Baron Jayathilaka Mawatha, Hatch is Sri Lanka's first and most dynamic start-up incubation and acceleration platform. In addition to its newly opened co-working space in Colombo, the organization also maintains a presence in Jaffna with Hatch Kalam, the first maker and co-worker space in the region.